The Adverse Events, Signs, and Management of Neonatal Bacillus Calmette-Guérin Vaccine Overdose. Confusing drug packaging contributes to death of 15 children. 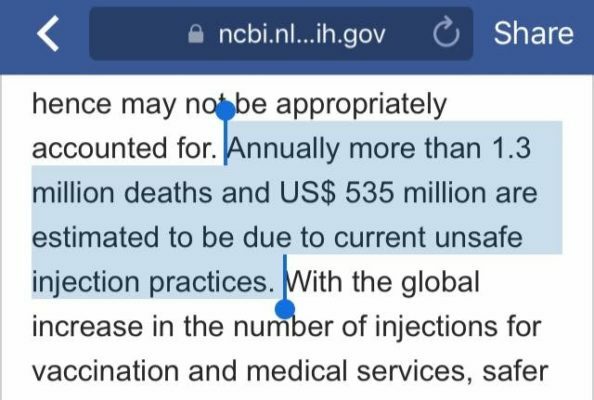 Contaminated vaccine deaths a serious setback for Syria. Elevated blood histamine caused by vaccinations and Vitamin C deficiency may mimic the shaken baby syndrome. Fetal damage after accidental polio vaccination of an immune mother. Morbidity and mortality from medical errors: an increasingly serious public health problem. Our prescription drugs kill us in large numbers. Suffolk County to conduct test of special safety syringes. A survey of mycoplasma detection in veterinary vaccines. Too much of a good thing: management of BCG vaccine overdose. Vaccine scandal and crisis in public confidence in China. Your Health Care May Kill You: Medical Errors. 2017.